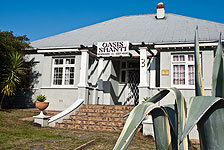 Oasis Shanti Backpacker Accommodation Oudtshoorn | Backpackers Route 62 Little Karoo | Single and Double Rooms | Family Rooms Dorms and Shady Camping. 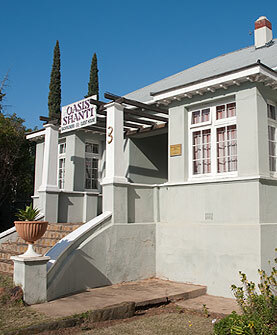 This small and friendly backpackers is located in a cheerful old house with a big shady garden, a large swimming pool (totally essential in summer), and a lazy lounging terrace for scrumptious ostrich egg breakfasts. A roaring fire warms the lounge on cold nights. 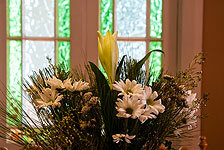 Visit our restaurant, La Dolce Vita (www.thesweetlife.co.za), for a variety of ostrich meals and local cuisine. The lodge offers comfortable single, double, triple and family rooms (some with en-suite facilities), a spacious dorm and shady camping spots as well as a self-catering flat. Situated in a leafy and historic neighbourhood, it is a peaceful place that's just a short walk away from the town centre.